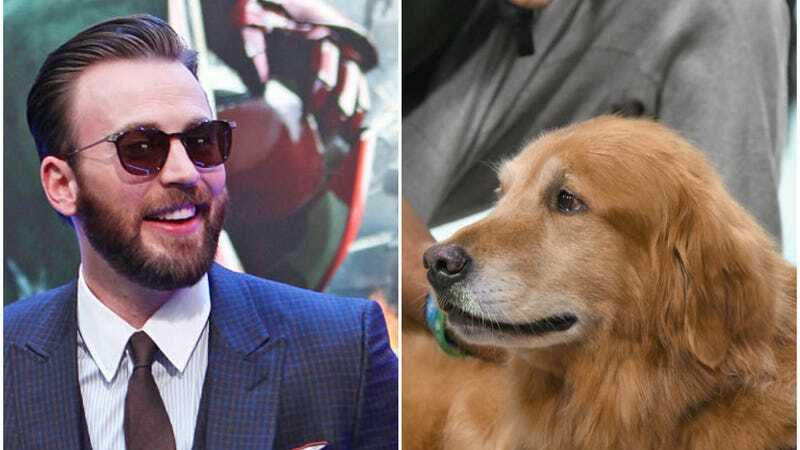 If it wasn’t enough that Chris Evans, an actor most notable for his roles as Captain America and Not Another Teen Movie’s Jake Wyler, is already handsome, rich, and apparently a decent guy, we’ve just learned something else in his favor: he’s a golden retriever. While Evans may have done a good job carrying himself like a human throughout many films and TV interviews (he’s an actor after all), the internet has not been fooled. It has, despite his various disguises, gathered substantive proof that shows, without a shadow of a doubt, that Evans is a shaggy yellow dog. The first suspicions were easy to ignore—even though the hints were there all along. The idea that Evans is a golden retriever was, for a long time, knowledge deeply intuited, but not proved. Before long, though, a Twitter account called “Chris Evans as Golden Retrievers” was set up to document the phenomenon in great depth. Each image seems to capture moments when Evans has let his guard down, replicating photographs of his true form in an eerily similar manner. The resemblance is so uncanny that there appears to be no other explanation for it than the unnerving possibility that the old legends of werewolves and shapeshifters are, in fact, true ... and that Chris Evans is a highly public member of their secretive ranks. It’s too early to say what we should do with this knowledge. As far as anyone knows, Golden Evans has only transformed for the power of good. Chicken coops near Hollywood sound stages have gone un-raided and dressing rooms neatly vacuumed of trademark yellow hairs. Since no harm is being done, the world may just have to learn to live with this revelation without it being confirmed by the man-dog himself. Or, perhaps, Evans will shock us all with an announcement made while his inhibitions have been lowered by someone pouring a few beers into his bowl.